The Cowboy Poetry Gathering at the Museum of Western Colorado in Grand Junction, Colo., was again a great success, with about a dozen cowboys and girls reading their poetry or playing their guitars to the cowboy verse. 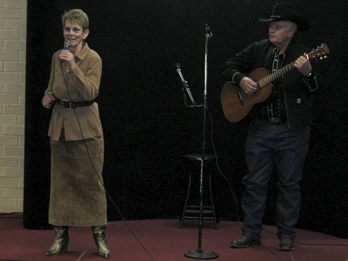 Throughout the day and evening of November 4-5, men and woman took turns in reciting original classic cowboy poetry, jokes and an occasional song. 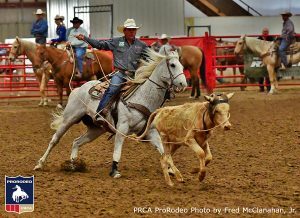 Cowboy poetry is a form of poetry which grew out of a tradition of extemporaneous composition carried on by workers on cattle drives and ranches. After a day of work, cowboys woulds gather around a campfire and entertain one another with tall tales and folk songs. Illiteracy was common, so poetic forms were employed to aid memory. Typical themes of cowboy poetry include: Ranch work and those who perform it, Western Lifestyle, Cowboy values and practices, Humorous anecdotes and Memories of times and people long gone. There was a little of everything at the gathering and this is just a few of those cowboys and girls that were at the event. All had wonderful poetry and stories to tell. Clarence Carnal just turned 102 in September and pretty much stole the show. He recited four poems from heart, with out missing a word. Clarence was born in Littleton, Colo., he was 5-years-old when his family moved to the Western Slope. They eventually settled on a ranch on the Uncompahgre River south of Montrose, Colo. His work in ranching ranged from Delta to Cimmarron with a number of jobs, bosses and experience. With eyes always twinkling, Clarence related stores and poems about everyday life on western Colorado Ranches. You can hear some of Clarence’s work narrated by him on U-Tube. Nora Kelley Carver of Mesa, Colo., lived in a log cabin without electricity during her early years. She learned to read by the kerosene lamp and rode horseback to school. She and her husband began ranching in the Mesa in the 1950s. Carver’s poetry has appeared in magazines, newspapers and anthologies. Chris Isaacs of Eager, Ariz., has cowboy’d for 60 years plus. He’s accumulated a lot of material for his poems and stories from years working as a cowboy, rodeoing, shoeing horses and packing. Frances Wheeler now 93-years-old, lived 75 years on the family ranch northeast of Steamboat Springs, Colo. Now a resident of Fruita, Colo., Francis is the author of several books and has performed at many poetry gatherings.